Mass media often presents a confused picture of today’s Middle East - riots in Egypt, murder in Benghazi, kidnappings in Sinai. Trusted alliances collapse as the influence of extremists continues to grow, even in Gulf countries such as Bahrain, Kuwait and Saudi Arabia. For governments, this means the loss of strategic partners, for investors and businesses an unpredictable situation. Who are the players? What are the prospects? How stabile are the governments? 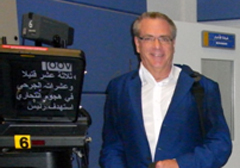 Jay Tuck has just finished producing a major 45-documentary on the history of the Royal Family of Abu Dhabi. He interviewed members of the ruling family and some of the richest people in the world, filming in their palaces as they described a childhood in the poverty of the early years, when the country had no streets or hospitals, no electric light and no running water. The film was broadcast in Germany in ZDF and by Natioinal Geographics. Its author offers behind-the-scenes background on the history and heritage of the UAE and how their leaders think. Qualifications: Jay Tuck has deep understanding of the Middle East. As founder and CEO of Airtime Dubai, a leading media company in the region, he has produced over 250 weekly half-hour segments – in Arabic – for Al-Jazeera Television. As a businessman, he has travelled the region extensively. As keynote speaker, he has appeared before the Chambers of Commerce in Dubai and Hamburg, the Emirates Economic Summit, as well as the World Bank. Artificial Intelligence is neither science fiction nor a PowerPoint dream. It is here and now, already changing our world at breathtaking speed. From airline markets to world financial markets AI is integrating billions of bits of global data into instantenous decision-making, macro managing our global resources, defining unseen challenges and securing our food chain and global environment. In the industrial world of 4.0, billions of indicators can be analyzed in microseconds. We, as individuals and as institutions, must be prepared to redefine ourselves constantly. But must we fear that AI will one day surpass us? It already has - in many sections of our society. Today, it is no longer just menial jobs that are being consumed by intelligent computers. We are relinquishing highly skilled positions of major responsibility. Slowly, surely, we are passing control in top management and marketing, in high finance and federal government, in medical research and in the military to the superior cognitive capabilities of Artificial Intelligence. This responsibility, once relinquished, will never return to humans. While the potential advantages - and profits - are enormous, many of the greatest thinkers of our time hold AI for a threat far greater than nuclear arms. There is no guarantee that we will always be Darwin's Darling. Qualifications: Jay Tuck is an internationally acclaimed speaker whose lively talks are accompanied by exclusive video and photographs. His TED-Talk reached 2 million views on the internet. Tuck speaks to private banks and financial institutions (World Bank, Chambers of Commerce, Patrizia), to gala events (Deloitte, ServicePlan), Media and Medical Congresses (WAZ, Universitätsklinikum Essen), Innovation and Research Symposia (Vodafone, Goethe University), as well as security and law enforcement conferences (Sicherheitsgespräche 2017).